Harriet McBryde Johnson died at home in South Carolina on June 4, 2008. She was a beloved disability and human rights activist. The world has lost a passionate and dedicated advocate for social change. Untold numbers in the disability community and beyond have lost a caring friend and role model. Harriet McBryde Johnson was a civil rights lawyer, a weaver of tales, and a spokesperson for the dignity and humanity of people with disabilities. Her 2006 memoir, a 2007 teen novel, and numerous articles and essays for the New York Times, including a cover piece in the New York Times Sunday magazine, helped thrust Harriet onto the national stage. She was featured as New Mobility Magazine’s 2003 Person of the Year. 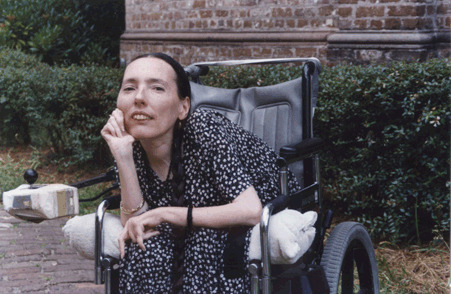 Johnson wrote passionately and with humor about a quite serious topic: her right and the rights of others, to exist in the world as a person with a disability. Her withering critique of those who would deny her existence was delivered with a calm and open-hearted voice. She had a warmth and generosity of spirit that was evident always. Through her activism, political commitment, and personal connections, Harriet left no doubt that her gift will be deeply missed. I reviewed Johnson’s memoir in BeyondChron shortly after its publication. The book captured Harriet’s unique blend of humor, serious activism, and front-porch story telling, and it would be a fitting tribute for every activist to read this book. At the time, the memoir appeared to be aptly titled “Too Late to Die Young”. But despite a productive life on so many, many levels, it turns out the title was wrong. Harriet’s death at age 50 comes far too soon for a world that still desperately needs her.